Look away, look away! Season two of A Series of Unfortunate Events has returned, continuing the grim tale of the Baudelaire children. Overall, season two is exceptional and continues to sustain the unique blend of dark comedy and colorful tragedy that the first season was known for. 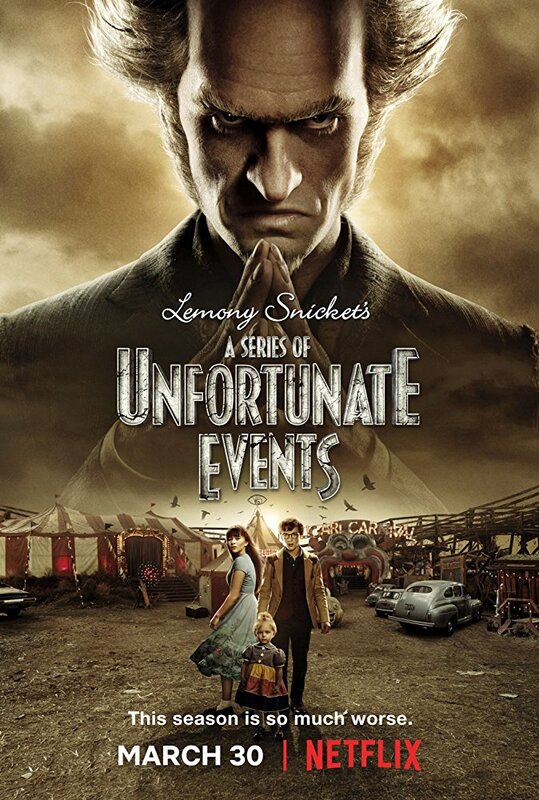 The second season of A Series of Unfortunate Events covers five books of the Lemony Snicket series: The Austere Academy, The Ersatz Elevator, The Vile Village, The Hostile Hospital and The Carnivorous Carnival. Just as last season, each book is covered within two episodes a piece – for a season of ten episodes in total. The season begins with a familiar structure akin to season one. The children find themselves in someone else’s custody, be it a school or guardian or even a collective village. Armed with nothing but wit and gumption (and perhaps a brilliant baby with super-biting ability), they then must solve the mysteries of their latest two-episode chapter. All the while, foiling Count Olaf’s plans and by happenstance, amassing clues as to what truly happened in their parent’s mansion fire. With this comes the usual hurdles to surmount with assistance. Overcoming the incompetence of their surrounding adults – especially that of their assigned guardians of the moment, by making friends along the way who are, as foretold by our narrator, Lemony Snicket, more-or-less are often doomed to a grisly and unfortunate fate. Though by mid-season, things change for the better. The characters grow along with the storytelling. The format shifts and becomes more consequential. Less the formula the series was known for, and more of a never-ending race to avoid a miserable fate. Evil closing in just as the answers sought are at the children’s grasp. With previous episodes’ actions dictating the escapes routes our heroes frequently must make. Season two very much focuses on growth by using the element of choice. The noble decisions made, but also, the wrong ones. How good people can make bad choices and at what costs. Which as we know in this series, usually means death. The season also brings more to light on the mysterious VFD. An organization with strange ties to the Baudelaire family, who ‘secretly’ tries to help from behind the scenes. We see the organization operate parallel to the children’s narrative. Though we’re also left just outside of its intentive loop until the end. Of course, all of this is happening while the Baudelaire’s try and evade the dastardly Count Olaf. 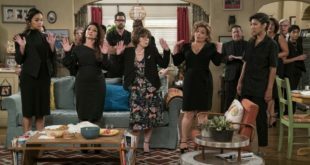 Who is still trying to pursue the orphans’ fortune – albeit as to no discernable reason why, as the series gets muddled with motivation midway. By the middle of Season Two, I didn’t understand why Olaf wanted the kids anymore. If he was out for revenge or if it was just blind stubbornness. Especially with the introduction of the brilliantly placed, Esme Squalor. The series tends to generate more questions than answers. With some of the longstanding ones, like what the VFD is, what happened during the fire, and what the deal is with this sugar bowl this season – all left semi-unanswered. By the end of season two, I didn’t fully know what was going on. But none of it seems to matter for a story bound by absurdity. It’s compelling to watch just for sheer entertainment. Visually, the show remains sharp. Utilizing a palate mixed of steampunk, gothic, Art Deco, and Victorian aesthetics this season. Featuring elaborate costumes designs, especially for count Olaf and troupe, and set-pieces that colorfully encapsulates the strange world it depicts. Especially, its contrarian nature. Cafe Salmonella. A fancy Salmon…everything. Likewise, the show remains consistency in its stylish tone. The focus on the importance of vocabulary and literature is still excellent. The series, always taking a step back to thank books, words, and most especially, librarians. Likewise, the deadpan delivery of Lemony Snicket delivers a hilarious interlude between scenes. He always reassures the audience, that despite resolve, gloom will always be the wholehearted nature of the series. Also, the mechanical steampunk era contraptions are still there. Providing absurd context as to when this story takes place, and also, comedy. With hilarious bits involving a state-of-the-art computer and a tumbling exchange between an airship and a harpoon, showcased later. More than ever, Neil Patrick Harris steals the show. His Count Olaf, equally menacing as he is unpredictable. Just as last season, Olaf forays into playing a melody of ill-conceived characters. None-of-which are culturally consistent nor sensitive. Showing Neil Patrick Harris’ range of acting talent – or intentionally lack-there-of, for the comedy in the series. In fact, there are lot of disguises outside of Count Olaf this season. None of them well-conceived for the audience, yet for some odd reason, are impeccably deceptive in this show’s world. Again, following this rule of absurdity: that adults can’t see what’s blindly in front of them compared to children. The reason I mention this was several critics have questioned the tastefulness of the series’ sensitivity toward culture with some of these disguises. Personally, I found the series consistently knowledgeable of its intended ignorance. With no particular gibe aimed at one group over another. The series emphasizing the lack of wit of its villains. Though it is still important to mention for sake of discourse. Especially after the accusations against the series author, Daniel Handler. Though it should be noted, Handler has nothing to do with the Netflix series, outside of his material being adapted. On a lighter note, this season’s musical numbers really stood out. 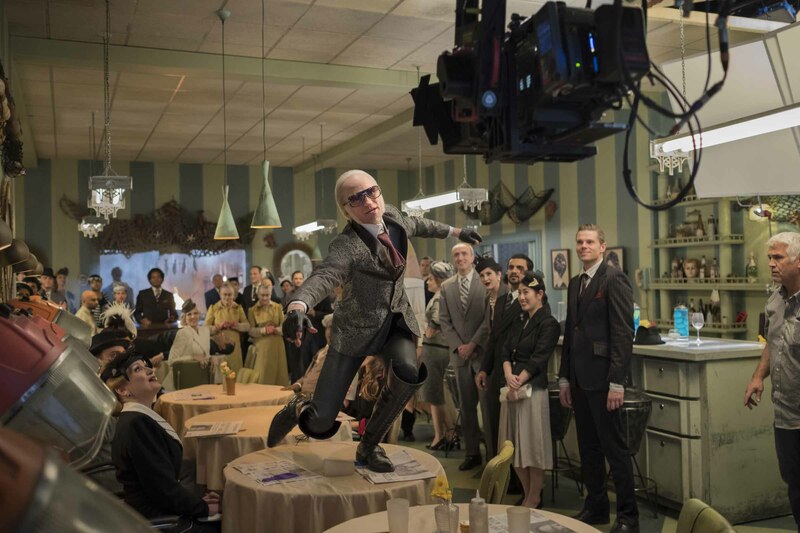 With excellent performances such as Count Olaf’s “Keep Chasing your Schemes” and “Welcome to the House of Freaks” these were some of the best numbers of the series. With Neil Patrick Harris showcasing his best singing and acting talent. Likewise, the acting has truly stepped up a notch. Lucy Punch, as Esme Squalor was a perfect addition to the cast. Her range is equally compelling to Neil Patrick Harris’, and above all else, is upliftingly nefarious in the worst of ways. Her screen time charisma is surpassed only by her elegance, with many comparisons to a Cruella DeVille of the sorts. 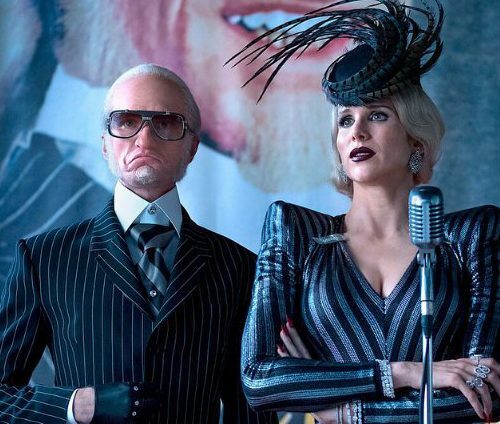 Above all, Lucy Punch’s role provides such a standalone counterpart to the villains of the series – a wonderful addition. The Baudelaires remain consistent. A wholesome presence amongst the dire nature of the series. They continue to operate with reason and pontificate with precision. Louis Hynes and Malina Weissman, the actors who play Klaus and Violet Baudelaire, remain always on point and in character. They seem better settled into their established roles in season two. Baby Sunny Boudelaire, played by Presley Smith, now a toddler, is likewise, still as refreshingly adorable as ever. She provides comedic relief and occasional hero of the day. There are also many new faces to the cast. In the beginnings of season two, the family shares screen time with the Quagmire family, played by newcomers Dylan Kingwell and Avi Lake. 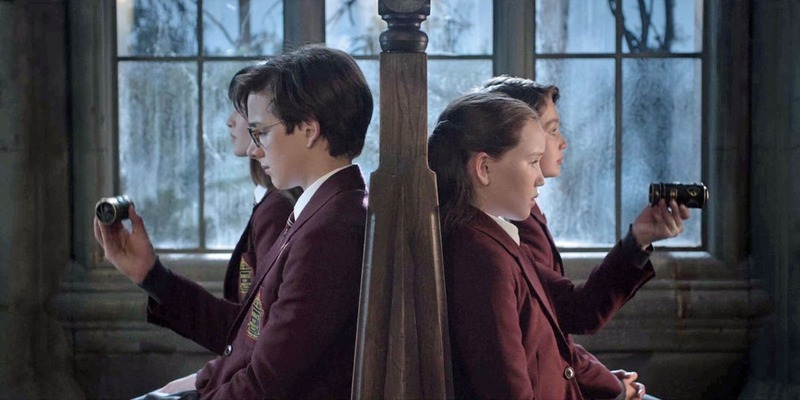 The Quagmires seem similar to the Baudelaires. Their backstory is tragic but also, each member specializes in a particular skill. Isadora (Avi), with poetry, and Duncan (Dylan), with journalism. Likewise, season two also focuses on two very special characters. Jacques Snicket, played by Nathan Fillion, is brother to Narrator Lemony Snicket, and the primary rival to Count Olaf. His story is very much that of the hero and his screen time with Neil Patrick Harris, feels very reminiscent of the duo’s performance in the cult classic, Dr. Horrible’s-Sing-Along Blog. Olivia Caliban, played by Sara Rue, is a librarian of Prufrock Preparatory School whose good nature, aptitude and curiosity, lead her on a perilous journey parallel to the Baudelaire’s misfortunate one. 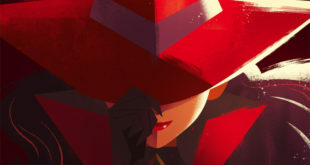 She becomes a much needed ally and a useful perspective of interest into the inner workings of the series mysterious origins. Overall, season two holding strong characters through and through. The show is a black comedy based on a children’s book series. It’s intentionally absurd in the ways all things are to the eyes of a child. That said, it’s nefarious but in a light way. Enjoyable and encourages learning – especially, reading. Watch season two if you enjoyed the first season. Expect more of the same but with a bit extra. With only one season remaining, A Series of Unfortunate Events will bow out in a way that’s hopefully faithful to the books. I’d definitely recommend it to a friend. Preferably, one into campy, evil misfortune.